Our doctors are skilled at providing comprehensive dry eye evaluations to help recommend the best treatment plan for your dry eye symptoms. Nearly 29 million people in the U.S. alone suffer from symptoms related to dry eyes. 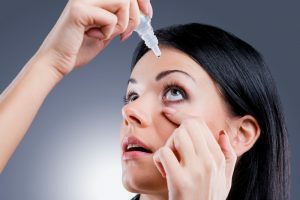 These symptoms may include stinging, burning, watering, redness, blurry vision, a scratchy or gritty sensation, and/or difficulty wearing contact lenses. Dry eyes usually result from poor quality tears or insufficient lubrication on the surface of your eyes. Our doctors recommend PRN (Physician Recommended Nutraceuticals) Dry Eye Omega-3 capsules/liquid for patients who suffer from dry eyes. This supplement is the only patented dry eye product on the market that has been clinically proven to improve symptoms of dry eyes. These capsules are uniquely formulated to promote optimal absorption of omega-3 throughout your body to improve the quality of your tears and dry eye symptoms. Schedule an appointment with our doctors today to see if you have dry eyes and are a good candidate for PRN supplements.